Updated Monday February 29, 2016 by Tamer Ozkan. and reliability will be expected at all times. 2. All players are required to attend every practice and be on time. 3. Players must be dressed and ready 15 min before practice starting time. game and playing time will be determined at the coach’s discretion. hair-ties, and removal of all jewelry and/or piercings. 2. At no time will a player wear game jersey to practice. 1. Players will buy Team uniform for their own personal use for the game. 3. Green, White or Black is the colors that players may wear under their jerseys. 1. All players are required to attend every game in uniform on time. 2. Any player unprepared on game day will face consequences at the coach’s discretion. 1. All players go on the half of field designated to their team. 2. All players do warm-up drills prepared by the coaches. 1. All substituting players must sit on the benches and focus to the game. 2. At no time players can leave the bench without the coach clearance. 3. At no time may players on the bench talk/yell to opponent players or refs. 4. Cell phone and any music devices use during games is prohibited. 1. Players issued yellow card will be out of game at least 15 min. 3. Players issued red card will not play next game. consideration of a longer suspension or possible dismissal from the team. External links are provided for reference purposes. Oyster Bay East Norwich Soccer Club is not responsible for the content of external Internet sites. 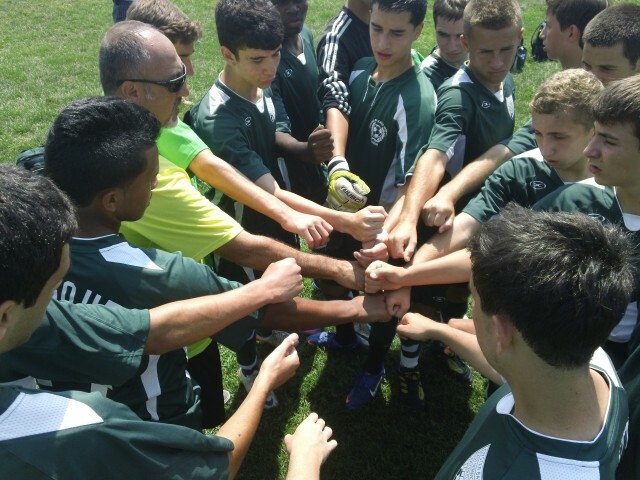 Copyright Oyster Bay East Norwich Soccer Club All rights Reserved.